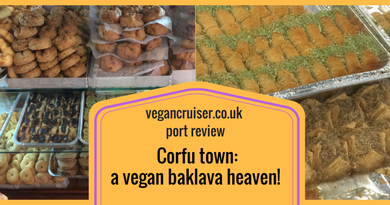 My DH pointed out that on the date when I came back from my last cruise was my 3-month veganniversary and suggested I would blog about it. So here I am. Three months vegan, then. Doesn’t time fly? And to be honest, it feels longer. It feels natural and it feels good. So satisfying to know that I am not contributing to the suffering and deaths of innocent animals. And I am also ashamed, thinking I got to almost 41 before I made the connection between the meat on my plate, the milk in my coffee and the suffering it necessitated. It is very much like coming to a faith in God as something suddenly everything makes sense – and those who don’t see things your way just don’t get it. Your eyes and your heart have opened to the truth that you didn’t quite grasp before. And how do I feel, physically? So much better. Have I lost weight? I don’t think so, but I wasn’t doing this for weight loss anyway. However, my general gut wellbeing is unlike never before. I am not bloated the way I was with dairy, days of cramps and/or flatulence are gone. I don’t suffer from digestive discomfort and constipation the way I used to. For my health, I wish I had made the change before – for the animals and for the environment too. But what I did, here’s how *I* have made a difference. How has it been then, these three months, you might ask? Have I struggled, missed bacon even? Am I withering away, only eating dust and leaves. I think if you tried to eat vegan as a mere diet, much like when you deny yourself chocolate and food while on a pre-holiday diet to lose weight, one might be tempted to cheat and have a BLT. But since veganism isn’t just another diet but an ethical way of living “which seeks to exclude, as far as is possible and practicable, all forms of exploitation of, and cruelty to, animals for food, clothing or any other purpose” (Vegan Society UK) I haven’t felt the need to go back to my old meat-eating ways. I’m not going to deny I enjoyed some of it, and others not (dodgy Chinese take-out chicken comes to mind) but that is now in the past. Many of my colleagues do seem to think of veganism in diet terms, as I’ve had people offer me cheesy crisps and say something like ‘oh go on, you can have it this once/you can cheat sometimes”. But I haven’t cheated or felt the need to cheat. How could I, every mouthful is an act of defiance almost, me making a statement that I won’t stand for the destruction of our planet. Every vegan meal is one of solidarity, as I refuse to partake in the suffering of animals. But I don’t miss anything. That is mostly because I eat the things I used to eat even before I was vegan. Still having sausages, chips, and beans. We even have a vegan-friendly chippie (Hooked) near us. Fish is off the menu, obviously, but they do vegan haggis and onion rings in a separate fryer. I still enjoy crisps (that’s potato chips) and wine. Chicken(less) nuggets. Pizza. Lasagna. Just that my mince is soy mince and the cheese and white sauce are vegan alternatives. We are so blessed to have plant-based alternatives to pretty much everything. I thought I would struggle giving up yoghurt and lactofree milk, as I’m not a fan of soy milk. But I discovered there are numerous dairy-free milk alternatives and I do like many non-soy ones. Oat milk is my absolute favourite. And my local supermarket Tesco supermarket sells an amazing range of own-label vegan products, including yoghurt, fromage frais, cheese and desserts. Even though I have a little less range in the supermarket, I have my essentials. And a visit to health food store gives me a greater range of cheese, sandwich ‘meat’ etc. Only today I picked up some vegan salami, smoked tofu, falafels.. No need for meat, death, suffering. And here is my main disappointment in the last three months of trying to live cruelty-free and vegan. Milk, bloody milk. It is EVERYWHERE! Breast milk for baby cows can be found in unexpected places. Almost every vegetable soup has it. Crisps (potato chips) are another mind boggler – most salt & vinegar flavoured ones have milk… but I can usually safely tuck into many ‘meaty’ flavours. And most dark chocolate has milk. It is frustrating. When you become vegan you also become suspicious of vitamins, E-numbers and additives. E901 is a sneaky way to say beeswax, which is used to make the product shiny. Case in point, veggie Percy pigs from M&S. No gelatin but full of beeswax. Animal-source vitamins make nearly all of Kellogg’s cereals in the UK unsuitable for the vegan diet. And bread products like some bagels and fajita wraps/tortillas? Often come with a side of a dough conditioner called L-cysteine. Nice way of saying either bird feathers or even human hair. Yummy…not. It is an education, indeed. I know I have been blessed and my transition has been easier having a vegan partner. How he endured my meat eating ways I’ll never fathom – maybe it is because he too was an omnivore once, even though that was 10+years ago. 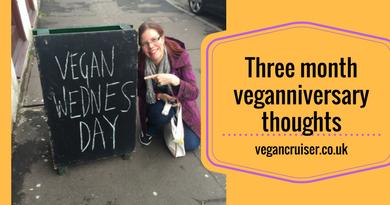 Having vegan friends who have been great by advising on negotiating such every-day essential things as vegan make-up, toiletries and household items has been helpful. And the Internet to the rescue – Vegan Supermarket Finds UK Facebook group has been a godsend. So verdict after 3 months? Go vegan. For the animals. For the environment. For your health. It is easier than you think it is. PS. 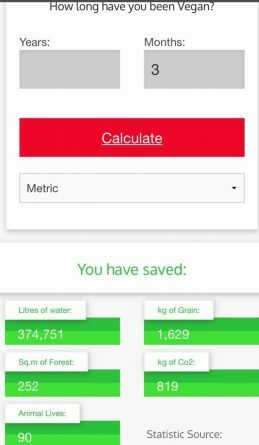 I watched Cowspiracy on Netflix and Vegucated on Youtube on the evening of Feb 28th and those two films made me finally change my life..
Really interesting post! I do think that a vegan diet may benefit me health wise, I have to be really careful about what I eat anyway. 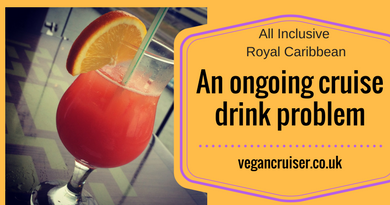 I honestly think a cruise would be the best time to try a vegan diet, because… somebody else is cooking! Personally I think egg would be the hardest thing to avoid, milk is in everything but I already don’t eat dairy so that’s no trouble. I was so so annoyed when they started putting real cheese in mini cheddars! 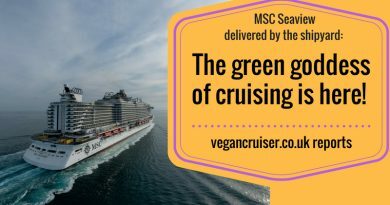 There was a point in time where they contained no cheese at all and I was quite happy with that..
Maybe you can take me on a cruise and show me the vegan ways  As long as you promise I won’t be hungry, think a lot of people have visions of vegans starving.